Rich and sweet Sherry oak favor and PX cask even sweeter, dark amber color and the darker the better, old aged and the older the better, all these phases are descriptions of impression of GlenDronach to many whisky lovers. In fact many I met and tasted are those mentioned above. I have had a good opportunity to meet and taste an “unusual" GlenDronach as follows. 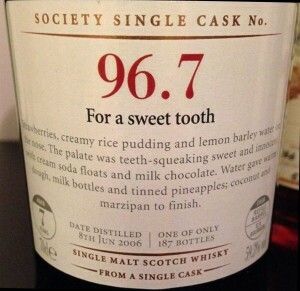 This GlenDronach is a SMWS bottling. Aged 7 years in ex-Bourbon barrel, plain and clear in color, a very young whisky. Quit different to my experienced GlenDronach. A very intereting whisky to me. The description is “For a sweet tooth". How sweet is it? Comment: Very fresh flower and citrus aroma, with some vanilla favor cake. Very powerful at palate, mainly nectar and candy, some white bread with residue of yeast, little alcohol burnt and dried wood. Long aftertaste, bitter woody tannin and citrus peel stuck at back of tongue and gum. Crisp and straight forward, explicit new whisky taste, somehow tasted like favored vodka, overly bitter in aftertaste but still acceptable, not bad but just OK dram. Sweet indeed but burn your tooth!